Less than 10 months after debuting Google’s first ever tablet-optimized platform with the Motorola XOOM, we’re already seeing Motorola’s second-generation Android tablets on sale and ready for the taking. This time however, the Motorola DROID XYBOARD 8.2 is packing a 1.2GHz dual-core TI OMAP 4430 processor, which will hopefully provide enough muscle power to offer us a decent experience. Although it’s mostly responsive out of the box, we do notice just a tiny bit of choppiness while navigating its homescreen with a static wallpaper. Switching over to a live wallpaper, it’s still able to exhibit a responsive rate without compromising that much with its movement – yet, it doesn’t have that buttery fluid nature we're desperate to see. Nevertheless, we’re content with its overall performance so far out of the box and operates very similar to other Honeycomb tablets in the past. Running the Quadrant benchmark test a few times, it doesn’t hit any earth shattering results, as we’re able to get scores ranging between 2,718 and 2,862 – so yeah, it’s very consistent, but lags behind some of the benchmark devices out there. 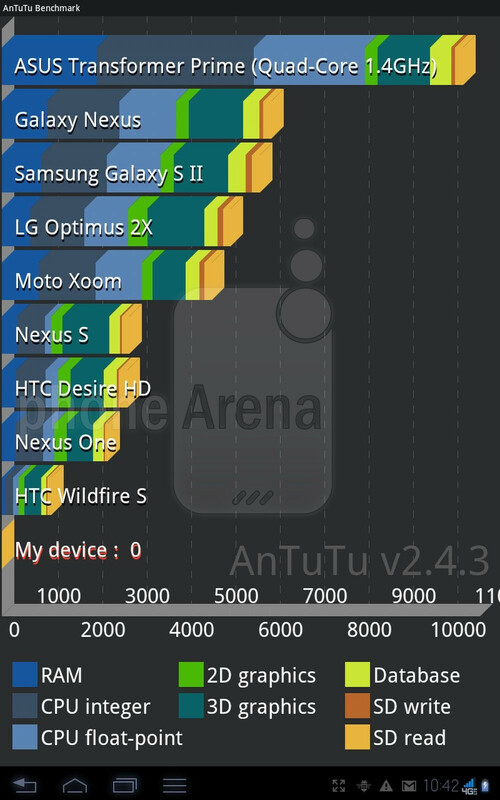 In addition, with the AnTutu benchmark test, the DROID XYBOARD 8.2 spits out a total score of 5,539, which again isn’t all that mind-boggling. In fact, it’s able to meet the mark established by the Samsung Galaxy S II and Galaxy Nexus. Are we saddened? Not so much, since it’s the typical thing we’re normally exposed to with most Honeycomb tablets, but it’s able to beat out the original Motorola XOOM, which had Quadrant and AnTutu benchmark scores of 2,249 and 2,296 respectively. For now, we’ll be a bit reserved until what we see with further testing. my g2x gets much higher scores than that. im waiting on a tegra 3 tab. well to be honest the tegra 3 isnt quite so flash, the GPU is much better than the tegra 2 but lags behind other processors such as the exynos found in the galaxy s2 and the A5 in the iphone 4s. 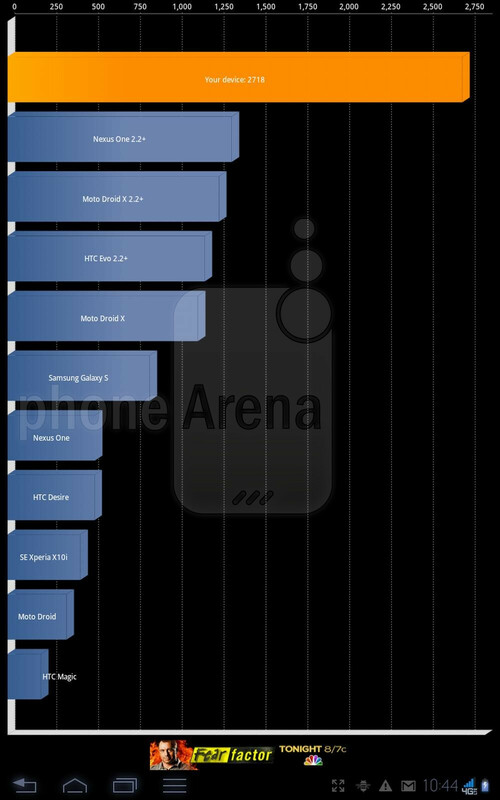 the tegra 3 CPU wise is prety good, but strugled to beat the ipad 2 in browsermark and in the java sunspider test. bulls**t. not a stock G2x. this'll perform better when it gets ICS. after all this does have practically the same processor that's in the Galaxy Nexus. 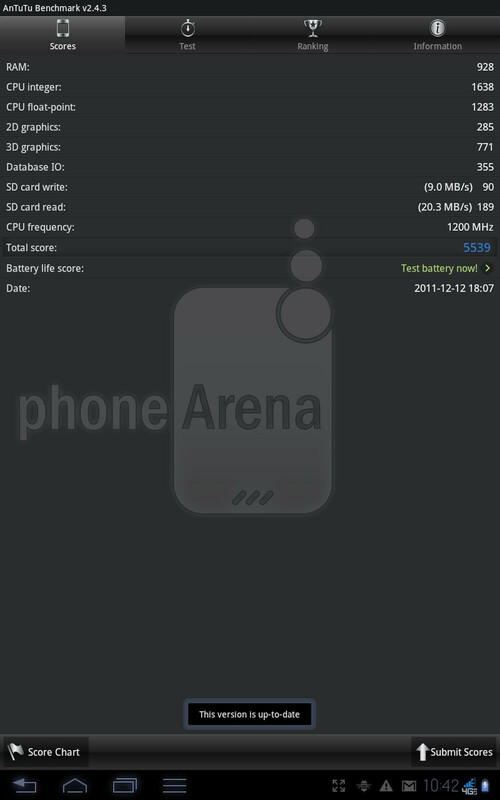 Can you please make Smartbench 2011 the standard benchmark for your benchmark articles and device tests. Benchmarks will become far less relevant when ICS updates everything, and I just got an HTC Flyer cheap so I ain't interested in this.